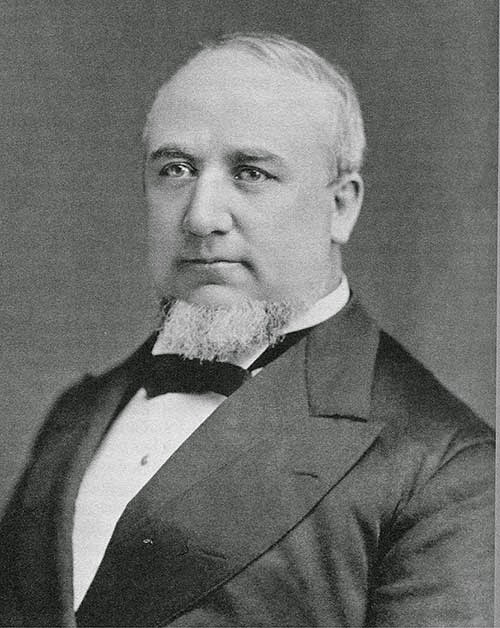 President George Q. Cannon (1827-1901) was called to the Quorum of Twelve in 1860. He served as counselor in the First Presidency to Brigham Young beginning in 1873, and then to the next three presidents, until his death in 1901. "The only way to maintain our position in the Kingdom of God is to so conduct ourselves that we may have a living testimony of the truth continually dwelling in our bosoms, to live so that the Spirit of the Lord may be a constant and abiding guest with us, whether in the privacy of our chamber, in the domestic circle or in the midst of the crowded thoroughfares, the busy scenes and anxious cares of life. 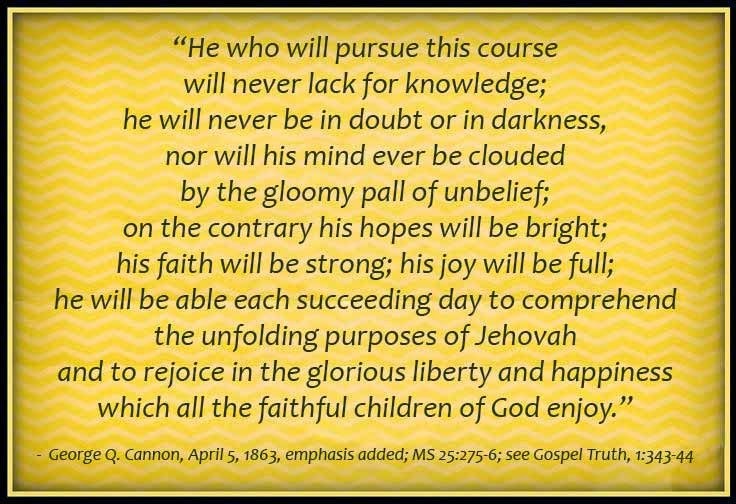 He who will pursue this course will never lack for knowledge; he will never be in doubt or in darkness, nor will his mind ever be clouded by the gloomy pall of unbelief; on the contrary his hopes will be bright; his faith will be strong; his joy will be full; he will be able each succeeding day to comprehend the unfolding purposes of Jehovah and to rejoice in the glorious liberty and happiness which all the faithful children of God enjoy. "It is not enough that we knew the truth of this work yesterday or the day before or a week or a month or a year ago; we ought to and must, in order to be happy, know it to be true today.... We can only retain the testimony of the truth in our heart by living near unto God. If we call upon Him in faith to bless us and seek to enjoy the companionship of the Holy Spirit, so ordering our lives that God can, consistently, bless us and the Spirit of the Lord can abide with us, we receive strength to overcome every evil and our minds instinctively recoil from the commission of any act which might grieve that Spirit or bring a stain upon our own character or upon the divine cause in which we are engaged." The final promise in this excerpt is also a glorious one—that we receive "strength to overcome every evil" because "our minds instinctively recoil from the commission of any act which might grieve that Spirit." I love that promise; what a wonderful, rich, fulfilling, joyful way to live!